Was violence was perpetrated by factions on both the left and the right side of the political spectrum during this rally? TRUMP: The driver of the car is a disgrace to himself, his family and this country. And that is, you can call it terrorism, you can call it murder, you can call it whatever you want. I would just call it as the fastest one to come up with a good verdict. That's what I'd call it. Because there is a question: Is it murder, is it terrorism? And then you get into legal semantics. The driver of the car is a murderer and what he did was a horrible, horrible, inexcusable thing. you had a group on one side that was bad. And you had a group on the other side that was also very violent. And nobody wants to say that. But I'll say it right now. You had a group, you had a group on the other side that came charging in without a permit and they were very, very violent. I've condemned neo Nazis. I've condemned many different groups. But not all of those people were neo Nazis, believe me. Not all of those people were white supremacists, by any stretch. Those people were also there because they wanted to protest the taking down of a statue, Robert E. Lee. REPORTER: Are you putting what you're calling the alt left and white supremacists on the same moral plane? TRUMP: I'm not putting anybody on a moral plane. What I'm saying is this. You had a group on one side and you had a group on the other and they came at each other with clubs and it was vicious and it was horrible and it was a horrible thing to watch. But there is another side. There was a group on this side, you can call them the left, you've just called them the left, that came, violently attacking the other group. So you can say what you want, but that's the way it is. TRUMP: Well, I do think there's blame, yes, I think there's blame on both sides. You look at both sides. I think there's blame on both sides. And I have no doubt about it. And you don't have any doubt about it either. And, and if you reported it accurately, you would say it. In the literal sense, yes. There's no question that both sides were mutually combative, engaging in fistfights and small-scale skirmishes with improvised melee weapons. You can just watch some video of the event and make your own judgement. You'll see there were plenty of small scale fights where both individuals are throwing punches. If we take the literal meaning of Trump's words, it is factually correct that there was violence on both sides. I don't believe this claim is subject to any controversy or dispute. In the way that Trump means, no. The controversy comes from the implication that there was approximately the same amount of violence from both sides, or that the violence from one side somehow excuses or lessens the violence committed by the other. Both are false. Trump is using rhetoric to assert a false equivalence. His argument is that since both sides committed some amount of violence they are therefore as violent/deplorable/bad as each other. It admits no nuance around the disproportionate scale of the violence (ignoring the helicopter crash, for which details haven't been released yet, there was 1 death and "more than 3 dozen" reported injuries, the former and more than half of the latter attributable to the vehicle attack alone), nor the mutual nature of much of the smaller-scale incidents, nor the underlying motivation for the violence. Only one person committed murder. Only one person employed a tactic used by terrorists, deliberately driving a vehicle into a crowd of people. Only one person committed an act which the U.S. Attorney General described as "domestic terrorism". This person's affiliation was not with the side claimed to have been "violently attacking the other group". He was an Ohio resident who traveled to Virginia to march alongside neo-Nazis, and his actions have been described by a member of that group as "points for us". Both sides were violent and had people arrested for it. One side did objectively more and objectively more severe violence than the other. However, that's not the side Trump is referring to when he calls one group "very, very violent". He's deliberately overstating the violence committed by one side, and understating the violence committed by the other. 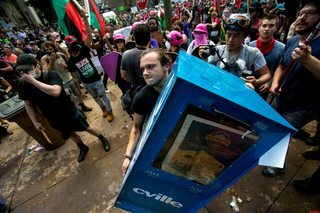 I was on Market Street around 11:30 a.m. when a counterprotester ripped a newspaper stand off the sidewalk and threw it at alt-right protesters. I saw another man from the white supremacist crowd being chased and beaten. People were hitting him with their signs. A much older man, also with the alt-right group, got pushed to the ground in the commotion. Someone raised a stick over his head and beat the man with it, and that’s when I screamed and ran over with several other strangers to help him to his feet. ... Some were shouting “Get out of our town!” at the alt-right as they marched. I joined in. So there was violence on both sides, but not to the degree of killing except by James Alex Fields Jr.
James Fields, from Ohio is being charged with 2nd-degree murder, 3 counts of malicious wounding and hit and run/failure to stop at a fatal vehicle collision after police say he drove into a crowd of counter-protesters. Jacob Leigh Smith [a counter protester according to other sources], from Louisa, Virginia is being charged with misdemeanor assault and battery after he was arrested Saturday. According to court documents, he was arrested after police said he hit a reporter [Ian M. Hoffmann]. “This man came up behind me and started yelling at me to stop recording. I showed him my press pass credentials and he started screaming at me then came up behind me and punched me in the face, I fell forward, he knocked the phone from my hand and threw me to the ground. I called for police to help, people were injured, but I still didn’t want him to get away with punching me then leaving. He kept threatening me, saying he would “beat my [expletive]” then said his “[expletive]” would beat my [expletive]. I was so scared, this man is dangerous,” read the police report. Troy Dunigan, from Chattanooga, Tennessee is being charged with misdemeanor disorderly conduct. He was arrested Saturday for throwing objects at “Nazi protesters,” according to court documents. “I was running security at [Emancipation Park] when a New York militiaman came up to me and stated that [Dunigan] was throwing something in the crowd. 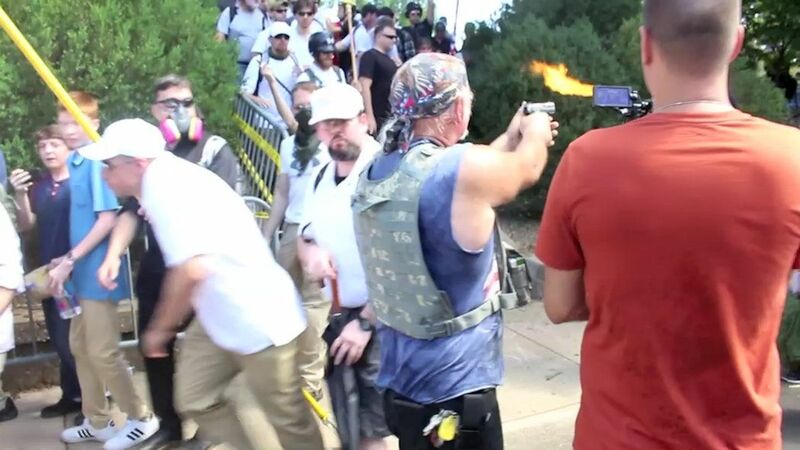 After questioning the accused, he stated ‘I’m sorry officer, I won’t do it again.’ He was throwing at the Nazi protesters in the Emancipation Park,” read the documents. Beth Foster, co-director for Mercy Junction Justice and Peace Center in Chattanooga, said Troy Dunigan wanted "to let everyone know he was in Charlottesville as part of an antifa action. He is an anarchist. He was here to confront white supremacy and antifa's practice is to use force if necessary in doing that." James M. O’Brien, of Gainesville, Florida was arrested Saturday and charged with misdemeanor carrying a concealed weapon. O’Brien has been released, but documents show that he will not be allowed to leave the state until his trial, set for Sept. 22 at 10:30 a.m. in Charlottesville. Another source says O'Brien is a member of Florida League of the South, which is a white nationalist group. He says he was arrested for having a concealed weapon without a permit, when he told police he had such a weapon, when police saw him breaking into his own car because he was locked out. David Parrot, from Paoli, Indiana was arrested Saturday and charged with failure to disperse a riot and will next appear at a hearing September 22 at 10:30 a.m.
Robert K. Litzenberger, from Charlottesville, was arrested Sunday after a Virginia State Trooper saw him spit on the man who organized Saturday’s rally, Jason Kessler. Police said Kessler was walking away from a press conference when the assault happened. During Kessler’s press conference, a crowd gathered. As the crowd grew more hostile towards Kessler, police provided him a safe exit from the site. Litzenberger is being charged with misdemeanor assault and battery. It is not clear at this time when he will next appear in court. No court documents have yet been obtained for Litzenberger’s arrest. In a meaningful way, no. There were not two sides present. The core event was a planned "Unite the Right" rally attended by militant white nationalists and others who had chosen to stand with them, "a patchwork of different alt-right groups attempting to show a unified front." They were met at various times by a variety of protesters ranging from the militant "antifa" anti-fascists to "local residents, members of church groups, civil rights leaders and onlookers." Many carried shields and clubs. A large number also carried pistols or long guns. It also explains many of the counter-protesters were armed. Members of anti-fascist groups yelled at the rallygoers. Many of them also carried sticks and shields. 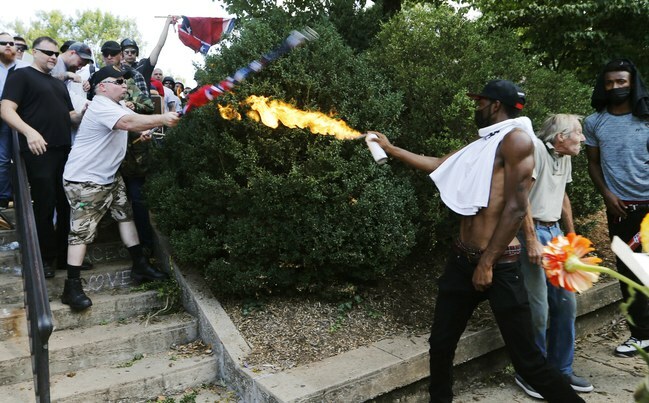 In a photograph from Charlottesville, two men extend weapons: one is the Confederate flag, furled, and the other is an aerosol can, modified to eject fire. Not the answer you're looking for? Browse other questions tagged united-states politics violence . Can hypnosis make things subjectively disappear? Is Trump the first politician to go on a victory tour since the Nuremberg Rallies? Did Ivana Trump claim under oath that she had been raped by Donald Trump? Did the United States reject an offer by North Korea to freeze their nuclear missile development? Did Antifa Exist as a Group in the USA Between 2000 and 2017?